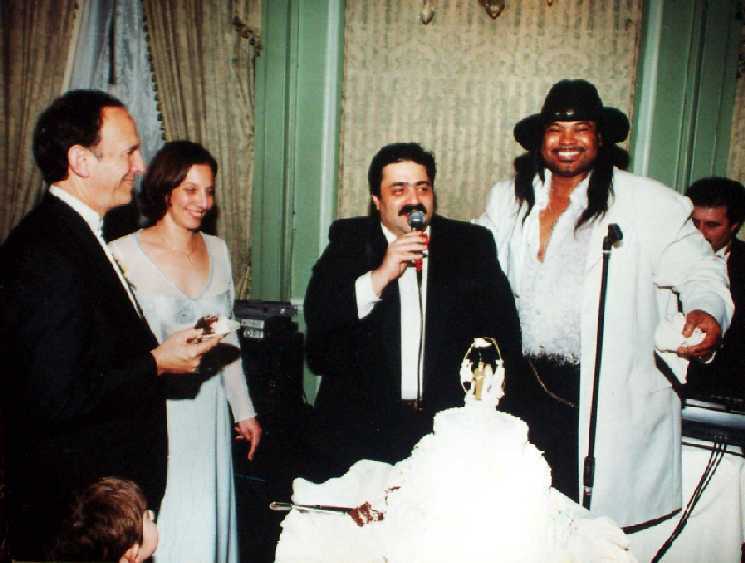 On 6 January 2001 Suzanne Smith and I were married in New York City.1 Before the service there was a choral music recital; at the party afterwards music was provided by Albert Narkolayev and his Mazel Tov Band.2 I had heard Albert playing with his band (then called Shalom Aleichem) at a Muslim wedding in Dushanbe, Tajikistan, in 1991 (HKFAA trip). I had been skeptical when he told me of his plans to come to New York, but he made it within the year. The 2001 version of his band, which had three members from his Dushanbe group, played traditional and modern Central Asian music as well as popular Western standards. In May 2001 we moved to Weehawken, New Jersey.3 From our home there it is a 15 minute walk along and down the New Jersey Palisades to the Port Imperial Pier, from which one can take one of the (spectacular but increasingly expensive) New York Waterways ferries across the Hudson River, 7 minutes to the 38th Street Pier in mid-town, or 15 - 30 minutes to the World Financial Center or Pier 11 by Wall Street. (Unlike in Cheung Chau, one can also go by bus, which outside of the rush hours takes 10 minutes to Port Authority Bus Terminal). From May 2009 to October 2013 we were back in Asia (Mumbai then Singapore). We then returned to Weehawken but still maintain an Asian base back in Cheung Chau. And I joined the newly-formed New York Qin Society. Many video clips of Albert and his band can be found online, including ones from a tour back to Dushanbe. The music they normally play is generally called "Bukharian". Many of the leading musicians in this style were Jewish, and Bukhara (now in Uzbekistan) had the oldest Jewish community in Central Asia (some claim the world, dating it to the Babylonian Captivity [Wiki]). There is some discussion of this music online, though as of 2010 the entry "Music" under the Wikipedia article Bukharan Jews confused this popular genre with one of its sources, the traditional form called Shashmaqam (Wiki). See also Ted Levin (Wiki), 100,000 Fools of God: Musical Travels in Central Asia (Indiana University Press, 1999). In 2010 Ted wrote me that it had become "common...for Bukharan Jewish musicians from the communities in New York and Tel Aviv to return to Central Asia to perform at big weddings (very prestigious for the families) and state-sponsored festivals (demonstrates the continuing grip of the Motherland on the diaspora)...."
See Weehawken History (and Time Machine), the Township of Weehawken, and this NY Times about a valuable nearby cliffside property, as well as Wikiwand (Weehawken Public Library) and Wikipedia (Weehawken).